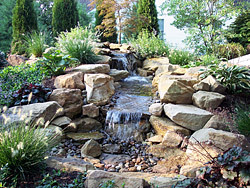 At Krefta Landscape we have many years of experience in creating beautiful ponds and waterfalls for both residential and commercial landscapes throughout the greater Eastern Massachusetts region. Water features are a very popular landscape addition for they add such a sense of tranquility and peace to any outdoor area. There is no doubt that the sounds coming from trickling water really has a relaxing effect on us. Therefore, what better way to relax after a stressful day than by your new pond or waterfall? You may choose to have a pond that is a feature of its own, while others prefer to have a pond at the end of a waterfall for extra effect and to replicate nature. The choice is yours. We can cater to any feature you have in mind. Our professional team at Krefta Landscape has all the expertise necessary to create a beautiful pond for your property and your requirements. Another popular addition when installing a pond is fish and KOI fish. 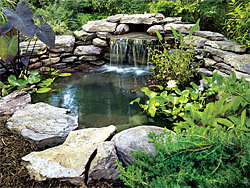 A KOI fish pond is a stylish centerpiece to any landscape setting. We will provide you with all the information you need to make the right decision for you and for your landscapes. Remember we are here to cater to your every need and to help you realize your landscape visions. The installation of a waterfall in any landscape setting is guaranteed to be a real eye catching inclusion. It will definitely change the whole look and feel of your property on a whole. Again, there are many choices when it comes to waterfalls you may want installed as a swimming pool feature, or perhaps you may want a pondless waterfall installed. Traditionally, waterfalls do have a pond as well but if you are short of space then let us work out the best design for you and your property. If you want to add a natural ambiance to your landscapes then the addition of a water feature of any type is the answer for you. Let the team at Krefta Landscape turn your backyard into a natural oasis! Hiring the help of a professional landscaping company means that you are always dealing with professionals in each field. 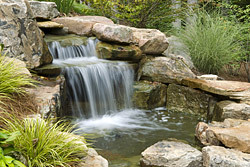 When it comes to the design of your pond or waterfall; our landscape designers are the best in the business. With many years of experience in creating stunning water features; Krefta Landscape is the team to trust. We will custom design and install a water feature that will enhance the overall look of your outdoor areas. No matter style of feature you have in mind, we can do the job. Using state of the art design software, equipment and the best materials on the market; you are ensured to have a water feature that you will be delighted with.